Gallipolis in Lights volunteers lace trees in Gallipolis City Park with lights in preparation for the annual lighting ceremony, Nov. 21. Last year, over 1,300 balls were hung in Gallipolis City Park. 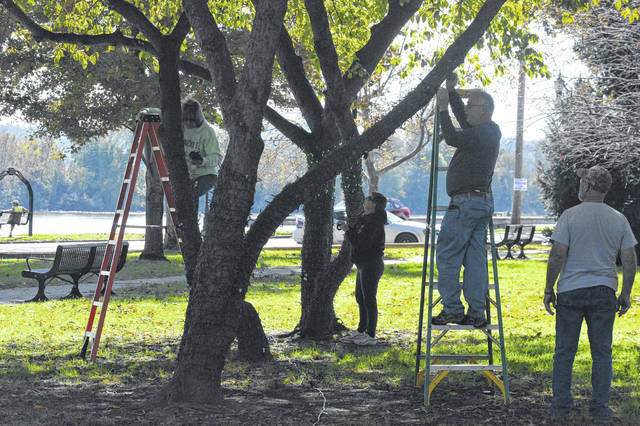 GALLLIPOLIS — Gallipolis in Lights is once again stringing lights throughout Gallipolis City Park in preparation for its holiday season. Last year, over 1,300 balls were hung in City Park. Lights are being hung right now with GIL volunteers when able. Placement of annual community Christmas trees for the Gallipolis in Lights Tree Walk will be Saturday, Nov. 17, at 9 a.m. The traditional lighting ceremony will be held Thankgiving Eve, Nov. 21, starting at 5:30 p.m. and the light switch thrown at 7 p.m. Live nativity scenes start Dec. 1 with free hot chocolate and cookies. Gallipolis in Lights annual Gala will be Thursday, Nov. 29. Those looking for tickets may call Amee Rees at 740-446-5005. Dean Wright can be reached at 740-446-2342, ext. 210.